The most corrupt state in America, Montana, is trying to send Bill Windsor to the Montana State Prison for seven years or the rest of his life. So, Bill Windsor traveled to Deer Lodge Montana to get the lay of the land. He drove from Missoula to Deer Lodge, and he looked for the prison. I asked four people for directions, and after the first three unsuccessful searches, I finally found a nice farmer lady driving a tractor down a dirt road who told me I needed to go to the only red light in town and turn right. The first three told me the same thing, but they didn't know their right from their left as it would have been a left turn from where they were asked. I did get to see the town landfill and some nice ranchland, gravel roads, and dirt roads before Ie found the farmer lady. Everyone seemed very happy to help; they just didn't know the word left. Never a single solitary sign, but I finally saw what I figured was the prison off in the distance. As I got closer, I saw some little signs that had WARNINGS. I drove cautiously onward past signs that said his vehicle could be searched and that if I was a bad guy, overnight accommodations would be arranged. I pulled slowly up to the Guard Shack and stopped. A female prison guard stuck her head out the window. Guard Gail asked if she could help me. I said: "I may be a resident here for seven years. Could I get a tour?" She told me they didn't give tours and that I couldn't drive the half a mile or so to the prison itself. Gail said I didn't look like their prisoners. I told her I've never used drugs and do not have a tattoo. She laughed and acknowledged that I would be a duck out of water. I told her I had friends "on the inside." She asked who, and I told her Patrick Austin. When I described him, she knew who he was. They do allow visitors, but you have to be approved a month or so in advance, and I flunked the admission requirements because I had been recently incarcerated and was out on bail. Gail said she hopes I am found not guilty, but she agreed to be my friend if I become incarcerated there. She was laughing as I hooked a U and headed back to the booming metropolis of Deer Lodge Montana. The Old Prison is right on the main street through town. It is now a museum, so I stopped for a tour of it. Next best thing, I figured. The museum man was delighted to take my money. It is a scary place like something out of a really old horrible prison movie. There's a gallows and other scary stuff. There are other "historical attractions" in Deer Lodge, a town that seems to be a prison tourist trap. Lots of cheap-looking motels for loved ones coming to visit their incarcerated friends and relatives. They proudly advertised things like Free Color TV, and whirlpool tubs was a big item. I saw a bakery with a big sign advertising pie. I haven't had a piece of pie in I don't know how long. I pulled up to park, and saw a sign: "CLOSED - GONE HUNTING." Maybe next time. Next to the landfill, the farmer lady who knew her left from her right, Gail, and the gallows, I was simply overjoyed to find that Deer Lodge Montana has not one, but two of the World's Largests. The World's Largest Draft Horse Sculpture, the World's Largest Railroad Track Spike. I'll add these to www.WorldsLargest.us. 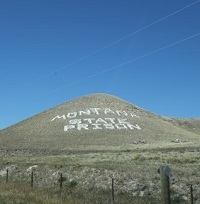 There are hardly any photos of the Montana State Prison online. I now know why; no one ever gets near it. Highway from Missoula to Deer Lodge Montana. I was in and around Deer Lodge for about three hours. After taking everything into consideration, I hope I never go back. Gail was nice, and I've never been in a whirlpool tub at a fleabag motel, but I think I'd rather be anywhere but Montana. From beautiful downtown Deer Lodge, I drove to the capital of Montana, Helena. I'll be here for a couple of days. Some people get frustrated when they can't find what they are looking for. I don't usually. It's all an adventure. Truth be told, the bad directions, the landfill, and the total absence of anything to indicate there was a prison around made the trip fun. Several years ago, I took a trip with a woman, and I called it "In Search of Elvis and the World's Largest Chili Dog." We didn't find Elvis, but we did find and fed his hungry cat, visited Graceland and Graceland Two, and we found there is no such thing as the World's Largest Chili Dog in Purley Texas. That was better than if we had actually seen one. I am hoping that when I die, someone will erect the World's Largest Chili Dog in Purley Texas. I'd be a happy camper to have my ashes scattered around the giant dog. What can I say. I love World's Largests, and I have a very quirky sense of humor.